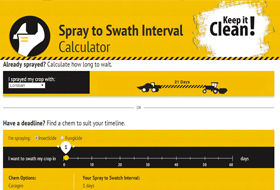 The SprayToSwath.ca website provides a handy calculator to help manage pre-harvest intervals (PHI). The Spray to Swath Interval is the minimum days between when you apply pesticides and when you can swath or straight combine your crop. On farm chemical labels, you’ll see it referred to as the Pre-Harvest Interval or PHI.